One of the most significant changes to the gambling environment in the past 15 years has been the increased availability of Internet gambling, including mobile; Internet gambling is the fastest growing mode of gambling and is changing the way that gamblers engage with this activity. Due to the high level of accessibility, immersive interface and ease at which money can be spent, concerns have been expressed that Internet gambling may increase rates of disordered gambling. The current paper aimed to provide an overview of the research to date as well as highlight new and interesting findings relevant to Internet gambling addiction. A comprehensive review of the existing literature was conducted to provide an overview of significant trends and developments in research that relates to disordered Internet gambling. 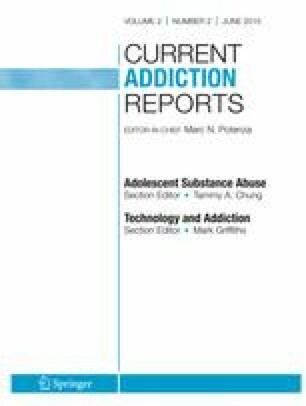 This paper presents research to inform a greater understanding of adult participation in Internet gambling, features of this interface that may impact problem severity, the relationship between Internet gambling and related problems, as well as considering the role of the wider spectrum of gambling behaviour and relevant individual factors that moderate this relationship. Internet gambling (a term largely interchangeable with interactive remote and online gambling) refers to the range of wagering and gaming activities offered through Internet-enabled devices, including computers, mobile and smart phones, tablets and digital television. This mode of gambling, facilitated by technological advances, increased Internet availability and ownership of Internet-enabled devices, is not a separate type of gambling activity. Rather it is a mode of access that is distinct from gambling in person at terrestrial or land-based retail outlets and placing wagers over the telephone. As such, it is a largely automated activity that could be conducted in private, at any time and location, using high-speed Internet connections enabling rapid placement of bets and notification of outcomes. The ability for large wagers, continuous gambling, rapid feedback and instant, easy access to a vast number of betting options has resulted in concerns that Internet gambling could contribute to excessive gambling [1, 2]. As a result of the empirical comparisons demonstrating the fundamental parallels between gambling problems and substance use, the fifth edition of the Diagnostic and Statistical Manual of Mental Disorders (DSM-5) includes a new category of Non-Substance Behavioural Addiction within the substance addictions category . Disordered gambling is classified as the first behavioural addiction and will serve as a ‘blueprint’ for research on other syndromes and arguably set a precedent for the compilation of evidence on other similarly excessive behaviours  such as ‘Internet gaming disorder’ (currently in section 3 of the DSM-5). Mounting evidence of distress and dysfunction related to excessive and problematic Internet use and specifically Internet gaming led the DSM-5 Taskforce to officially call for further research on this behaviour . Given the similarities in the experience and excessive use of Internet gambling and gaming and the potential for harm based on excessive Internet use, pathological use of Internet gambling also warrants specific consideration . The current paper aimed to provide an overview of the research to date as well as highlight new and interesting findings relevant to adult Internet gambling addiction. A comprehensive review of the existing literature was conducted to provide an overview of significant trends and developments in research that relates to disordered Internet gambling. Internet gambling is growing rapidly in terms of popularity, market share and products offered. The online global gambling market was valued at €6.1 billion in 2013, with expected annual growth of 10.1 % in 2018 . Online gambling accounted for an estimated 8–10 % of the total global gambling market in 2012, and this proportion appears to be increasing [7, 8, 9]. Globally, the largest online gambling product is wagering, accounting for 53 % of the online gambling market, followed by casino games (including slot machines/pokies/electronic gaming machines, 25.4 %), poker (14.2 %), and bingo (7.4 %) . Internationally, an increasing number of jurisdictions are legalizing and regulating Internet gambling . This follows recognition of the difficulties of enforcing prohibition and the benefits of regulation, including requiring harm minimization measures to enhance consumer protection, and generating taxation revenue . Although the prevalence of Internet gambling appears to be relatively low, participation is increasing rapidly, particularly in jurisdictions that permit access to regulated sites [11, 12••]. For example, in Australia following the legalization of Internet wagering and lottery playing, prevalence rates in Internet gambling rose from less than 1 % in 1999 to 8.1 % in 2011 . Similarly in the UK, an average of 16 % of respondents had participated in at least one form of online gambling in the previous 4 weeks . In comparison, only 6 % of the British population used the Internet to gamble in the past year in 2007, although this figure does not include purchasing lottery tickets online, which may have increased the participation rate . Internet gambling use is likely to continue to grow as online platforms become increasingly used to engage in entertainment and recreational activities, including through phones and other wireless devices. Research suggests that the most commonly reported motivators and advantages of Internet gambling are the convenience and accessibility of this mode [15, 16, 17]. Other commonly stated advantages of Internet gambling include greater value for money, including payout rates and bonuses, the speed and ease of online gambling, greater number of betting products and options and the physical comfort of being able to gamble from home. Internet gambling represents a fundamental shift in how consumers engage in gambling, and concerns have been expressed by various stakeholders about these changes. Disadvantages cited by Internet gamblers include that it is easier to spend money online, it is too convenient and concerns about account safety [15, 16, 17, 18, 19•, 20]. Other concerns include that the high accessibility to Internet gambling may increase gambling, particularly among technology-savvy youth, and lead to an increase in the incidence and prevalence of disordered gambling [1, 21]. These concerns have led to recommendations for Internet gambling to be prohibited, or conversely regulated, in an attempt to institute policies to minimize harms [1, 12••, 18, 22, 23•, 24]. Evidence suggests that there is a relationship, albeit complex, between the availability of gambling opportunities and increased levels of related problems [25, 26, 27, 28, 29, 30]. Consequently, it has been asserted that the easy access to gambling provided by Internet modes may lead to the development or exacerbation of gambling problems [1, 22, 24, 31]. Internet gambling also has some unique features that may pose additional risks for harm, particularly for vulnerable populations. Internet gambling differs from land-based gambling primarily in terms of its constant availability, easy access and ability to bet for uninterrupted periods in private, facilitated by the interactive and immersive Internet environment [2, 18, 32, 33, 34, 35•]. The use of digital forms of money (e.g. credit cards, electronic bank transfers and e-wallets) appears to lead to increased gambling and losses, particularly for problem gamblers, as people feel that they are not spending ‘real’ money [16, 32, 36, 38, 39]. Surveys indicate that 19–28 % of online gamblers report it is easier to spend more money online [20, 39], while 15 % consider this form to be more addictive than land-based gambling . The immersive nature of Internet gambling is also clear through reports that online gamblers, particularly those experiencing problems, are more likely to report disruption to their sleep and eating patterns than land-based gamblers [18, 36, 37]. Data collected by gambling treatment services suggest that Internet gambling currently makes a small, but growing, contribution to gambling problems among those seeking formal help [37, 40, 41]. Surveys have found that online problem gamblers are significantly less likely to have sought formal help as compared to land-based problem gamblers [20, 42, 43]. This suggests that problems related to Internet gambling may be underrepresented in treatment-seeking samples and are likely to increase over time as more people participate in this mode and problem severity increases. Initial concerns over the harmful effects of Internet gambling are sensible as numerous studies have found greater levels of problem gambling severity amongst samples of Internet as compared to non-Internet gamblers [13, 31, 41, 43, 44, 45, 46, 47•, 48]. For example, in an Australian nationally representative prevalence survey, the overall problem gambling rate among Australian non-Internet gamblers was 0.9 %. In comparison, the rate among Internet gamblers was three times higher at 2.7 % . Fewer than 60 % of Internet gamblers were classified as non-problem gamblers, compared to more than 80 % of non-Internet gamblers, which was a significant difference. Furthermore, the average PGSI score of Internet gamblers was significantly higher than that of non-Internet gamblers. Similarly, a total of 16.4 % of Internet gamblers were classified as either moderate or problem gamblers, compared to a rate of 5.7 % among non-Internet gamblers . However, there is little evidence available that would enable the causation of Internet-related gambling problems to be determined, and most longitudinal studies contain too few Internet gamblers to provide meaningful analyses. Despite some indications of a positive correlation, the relationship between Internet gambling participation and problems has not been confirmed. Some studies have found similar rates of gambling problems among Internet and land-based gamblers [15, 41]. Research also suggests that very few Internet gamblers gamble exclusively online [12••, 24, 48, 49]. Further analyses of prevalence studies that control for factors such as demographic variables and gambling involvement have found that participation in Internet gambling does not independently predict problem gambling severity [13, 20, 36, 46, 50••, 51, 52]. For example, even though Internet gamblers were more likely to be classified as being at risk or experiencing gambling problems in a nationally representative survey, when other variables were controlled for, Internet gambling participation was not predictive of problem gambling severity . Similarly, using data from the 2007 British Gambling Prevalence Study, LaPlante and colleagues [50••] found that gambling formats (particularly Internet gambling) and problem gambling were not significantly related when gambling involvement was included in the model (based on the number of gambling activities used in the past 12 months). This finding was in contrast to earlier analyses  and demonstrates the importance of controlling for confounding factors. Further evidence to question the extent to which Internet gambling increases rates of problem gambling can be taken from prevalence studies. Despite rates of Internet gambling increasing in several jurisdictions, little evidence has been found to suggest that the prevalence of problem gambling has increased [13, 53, 54]. An analysis across 30 European jurisdictions failed to identify any association between prohibitions against online gambling, gambling licencing systems, the extent of legal gambling opportunities and the prevalence of gambling disorder [55••]. Evidence is emerging that Internet gambling is not only predictive of gambling problems but also that when other variables are controlled for, individuals who gamble online may have lower rates of gambling problems. Studies that have isolated Internet-only gamblers have found that these gamblers have lower rates of gambling problems than gamblers who only gamble offline and those who use both online and offline modes [48, 51, 56•]. Gamblers who engage in online as well as offline modes appear to have the greatest risks of harm, which is likely related to their greater overall gambling involvement [48, 56•, 57••]. The relationship between Internet and problem gambling is likely mediated by the use of land-based gambling. A study examining actual Internet gambling account activity combined with a self-report measure of gambling problems confirmed that gambling involvement, as indicated by number of games played and days bets placed on in past year, is predictive of gambling problems amongst the sample of Internet gamblers analysed . These results are consistent with a wide body of research which suggests that gambling disorder is related to high levels of involvement (in terms of expenditure, time, frequency and variety of gambling forms used) [13, 36, 52, 59, 60, 61, 62, 63]. Therefore, research suggests that highly involved gamblers are more likely to engage with Internet modes, including those with existing gambling problems, than less involved gamblers. However, a study comparing behavioural data from online gambling sites with self-report of gambling problems found that not all highly involved gamblers were at risk for gambling-related problems, and likewise, not all those with low involvement screened negatively for gambling-related problems . This is an important finding as it demonstrates (unsurprisingly) that a single gambling index (such as a frequency of gambling, or expenditure) is not adequate to predict gambling problems. Involvement in Internet gambling appears to be more likely among gamblers with existing problems as compared to non-problem gamblers [35•]. Studies have found that one third to one half of Internet gamblers experiencing gambling problems attribute these to land-based forms of gambling, and over half report that they had existing problems before they ever gambled online [13, 20]. This is consistent with one study reporting that problem Internet gamblers prefer land-based over Internet gambling . Few studies have investigated the types of gambling that are most likely to be associated with problems related to Internet gambling. In an Australian national survey, almost half of all gamblers stated that land-based electronic gaming machines were the primary cause of their problems, including among Internet gamblers . Internet gamblers are most likely to associate their problems with casino games, sports and race wagering and poker [13, 20]. In particular, sports betting appeared to be associated with moderate risk and problem gambling, a finding not replicated among land-based only gamblers [13, 20]. However, this finding may be specific to the Australian context as sports wagering is one of the few legal forms of online gambling. Conversely, for some Internet problem gamblers, this mode of gambling appears to be the proximal cause of problems, with problem gamblers reporting that their problems started after they first gambled online and around half specifically attributing problems to this mode [13, 20]. These results are consistent with other research findings [57••, 48], suggesting that for some problem gamblers, Internet gambling played an important causal role, while others had existing problems, which were likely exacerbated by Internet gambling. However, most studies examining the relationship between Internet gambling and problems are cross-sectional, which do not allow for causality to be determined and self-report is subject to bias and reliant on accuracy of reporting. Longitudinal research will be an important addition to this field to address these issues. As Internet gambling increases in popularity and use, it is likely that the next generation of gamblers will use Internet modes earlier in their gambling career, which may increase the proportion of individuals who experience problems that are attributed to this mode. However, there is a growing recognition that Internet gamblers are a heterogeneous group, and research needs to consider how Internet gambling behaviour may be integrated more broadly with offline gambling [48, 65]. Analysis of demographic variables suggests that Internet problem gamblers overall do not represent a distinctly different cohort than gamblers who experience problems related to land-based gambling. Risk factors for Internet problem gambling identified include being male, younger adults, and being from a culturally diverse background [13, 20, 41, 66, 67]. The consistent relationship found between problematic Internet gambling and younger age suggests that this population is particularly vulnerable to harms related to this form, and use of Internet gambling amongst young males is an area that warrants further attention in terms of research as well as harm minimisation. Risk factors identified do not appear to be universal; for example, Gainsbury, Russell, Wood, Hing and Blaszczynski  found problem Internet gamblers more likely to be young, less educated and have greater debts than non-problem Internet gamblers. A subsequent study found only age differed between Internet and non-Internet problem gamblers when controlling for Internet gambling participation, and there were no significant differences based on education or income . In contrast, Jiménez-Murcia and colleagues  found that online problem gamblers had higher educational levels and higher socio-economic status than non-Internet problem gamblers; however, both groups showed similar psychopathological profiles or personality characteristics. Other studies have also found that Internet gamblers are more likely to have higher educational levels and socio-economic profiles [e.g. 43, 48, 65], as well as higher levels of problem gambling than non-Internet gamblers. However, these are associations that do not control for the interaction between variables so it is difficult to draw firm conclusions about problem as compared to non-problem Internet gamblers. It is likely that the profile of those at risk for developing Internet gambling problems will change as this mode of gambling becomes more accepted and widely used and further research is conducted. Studies have also found higher rates of health and mental health comorbidities, including smoking and alcohol consumption, as well as substance abuse or dependence, and mood disorders among Internet as compared to non-Internet gamblers [13, 15, 30, 31, 43, 44, 47•, 49, 57••, 67, 69, 70]. \One study found that Internet gambling frequency was significantly associated with poor physical and mental health, after controlling for demographics and pathological gambling, but overall gambling frequency was not . A study examining irrational and erroneous thinking found that greater levels of erroneous cognitions significantly predicted problem gambling severity when controlling for other variables among Internet gamblers . As psychological comorbidities and irrational thinking are related to problems amongst land-based gamblers, these results suggest that the clinical characteristics of Internet problem gamblers are similar to offline gamblers. There is also evidence that Internet problem gamblers have higher rates of drug and alcohol use than non-problem gamblers. Analysis of 1119 surveys completed by online gamblers indicated that compared to non-problem gamblers, problem gamblers were more likely to smoke cigarettes, have a disability and drink alcohol while gambling online . This is consistent with higher rates of mood and substance use disorders and self-harm among highly involved Internet gamblers . An Australian telephone survey found that illicit drug use was a significant predictor of having greater levels of gambling problems . These results may indicate that Internet gamblers who are at risk for gambling problems may engage in a range of risk-taking behaviours, for example, due to high levels of impulsivity . Nonetheless, the relationships between Internet gambling, gambling problems and other mental health issues are still unclear . For example, multiple studies in Sweden did not support the assumption that Internet gambling would attract people with low social support, psychological problems, physical problems or health problems such as risky alcohol consumption . Similarly, offline gamblers were more likely to report health and psychological impacts of problem gambling than Internet gamblers in an Australian study comparing at-risk and problem gamblers . Furthermore, in a nationally representative Australian telephone survey, Internet gamblers were less likely to drink alcohol and smoke when they were gambling online than when gambling in land-based venues, indicating they were unlikely to be using Internet modes to avoid restrictions on smoking or alcohol . Overall, existing studies fail to define specific personal or behavioural risk factors to differentiate between Internet and non-Internet problem gamblers. There is some evidence that these do represent at least partially different cohorts; however, the heterogeneity in each group makes specific risk factors difficult to identify. No studies have established the causation between associations found and the direction of any link between problem online gambling. The individual factors related to Internet gambling problems are under-researched and would benefit from longitudinal studies to clarify the mechanism of action of any relationships between variables. Intense gambling involvement has been verified as a predictor of gambling problems for online and offline gamblers. Other gambling-related behaviours have also been identified as being potential markers of risky Internet gambling. Gambling online on unregulated sites [41, 74] and using multiple different accounts  and different online activities [20, 48, 57••] have been found to be predictive of higher levels of gambling problems. It is possible that unregulated sites attract individuals who are at greater risk for experiencing problems, and use of multiple online accounts and multiple activities is a proxy indicator of gambling involvement, a known predictor of harm. Analyses of player accounts, including players who exhibit what appears to be risky behaviour, as well as those who have closed accounts due to stated gambling problems, have enabled markers of problem gambling, including early predictors, to be identified. Potential predictors of risky Internet gambling or the emergence of problems include engaging in multiple online gambling activities, high variability in betting, multiple bets per day, many active betting days per month, many bets per betting day, high overall stakes and net loss, increasing bet size and losses, chasing losses and intervals of increasing wagering size, followed by rapid drops [58, 59, 76, 77, 78, 79, 80]. One notable finding from studies of the bwin.party dataset (which include most of the behavioural analyses that have been conducted) is the consistent finding that participation in live action sports betting (also known as in-play) is an independent predictor of problem gambling severity, when controlling for gambling involvement [58, 59, 79]. This type of betting allows frequent and repeated bets to be placed during a single sporting event, with rapidly determined outcomes, which may be particularly attractive to people who are highly impulsive and at greater risk for disordered gambling . However, this relationship has not been investigated in independent samples. In addition to behavioural variables, other information about gamblers’ risk levels can be observed by online operators. Analysis of customer communication with online operators identified risk markers that predicted customers closing their accounts due to stated gambling problems. These included expressed doubts about results of games, requests for account reopening, queries about financial transactions and account administration, the frequency of contacts per month (urgency) and use of a threatening tonality . These results were based on a relatively small sample with a limited control group. A subsequent study found that automated text analyses of email correspondence aided by human assessment could identify anger (abusive tonality) as well as urgency (time-related words) and a lower use of justification for demands and/or actions, which were found to predict self-exclusion . Single, unmistakable indicators for problems are uncommon, and therefore detection of risk indicators usually relies on algorithms to detect interaction between these. Further research is still required to untangle whether game-specific characteristics play a causal role in the emergence of gambling problems. Research is also needed on a variety of different player accounts, as the vast majority of research has been done with a single dataset from one European gambling site, which may not be generalizable to other online gamblers. Identifying, detecting and acting on early risk indicators may reduce gambling-related harms sustained by Internet gamblers. However, few online operators have shared their data to be used for research purposes or implemented policies and strategies to detect potentially risky players and implement appropriate resources. Such preventative action is generally not required by Internet gambling regulators, meaning that further action is reliant on operator-initiated action. Taken together, the evidence reviewed here suggests that Internet gambling does not cause gambling problems in, and of, itself. However, use of Internet gambling is more common among highly involved gamblers, and for some Internet gamblers, this medium appears to significantly contribute to gambling problems. Internet gamblers are a heterogeneous group, and the impact of this mode of access on gambling problems is moderated by a range of individual, social and environmental variables. As Internet gambling continues to evolve and participation increases, particularly among young people who are highly familiar with Internet technology and online commerce, it is likely that related problems will emerge. Research and regulation will have to evolve to further the understanding of the impact of this mode of access on the experience and incidence of gambling disorders. There appear to be some unique differences between Internet and land-based gamblers who experience problems . Theoretical models for gambling and problem gambling have been developed based on land-based gambling, largely not considering the recent emergence of Internet modes. It is important to revisit these conceptual models to verify if they account for pathological gambling among Internet gamblers and whether any new variables or interactions should be included to explain the emergence of gambling problems. Research will likely continue to distinguish the characteristics (mediators and moderator) that may be used to identify online gamblers who are at risk for gambling-related problems. This is necessary to develop a more comprehensive understanding of how people develop gambling problems. Research is needed to understand how to reduce the likelihood of people transitioning to disordered gambling. The Internet offers a potentially strong environment for the provision of responsible gambling, including player-focused tools and resources for moderating play such as expenditure tracking, self-set spend limits, time outs and information [19•, 84]. Furthermore, operators can enact strategies to assist customers including targeted notifications (e.g. pop-up messages) based on patterns of play and other tailored contacts derived from analysis of player accounts to identify risky behaviour [2, 85]. Enhancing the provision of a responsible gambling environment will require cooperation between independent researchers to design, evaluate and verify strategies, operators to enable access to appropriate data and implement procedures and regulators to require the use of effective responsible gambling policies. Treatment and prevention strategies must be revisited to ensure that these are relevant and effective for Internet gamblers. Brief online interventions as well as in-depth online treatment programmes may be relevant for Internet gamblers . Online self-exclusion programmes should be developed that would allow individuals to exclude themselves from multiple gambling sites simultaneously. The findings presented here are important for policy makers due to evidence that Internet gambling in itself is not harmful. The research is also relevant for clinicians, as it suggests that in addition to some gambling forms being more likely to lead to problems, how individuals access these also has an impact on subsequent harms. This highlights the importance of considering the broad spectrum of gambling behaviour and how different patterns of gambling may be associated with the experience of gambling-related harm. Further research is required to identify the protective factors of online gambling environments that may reduce levels of harms among Internet gamblers. These may include the capacity for lower bet sizes than in land-based venues (due to lower costs for operators); the ability to track wins, losses and deposits using an online account, gambling only for short sessions due to other activities concurrently occurring in the home, or outside of a gambling venue; the presence of others when gambling; and access to responsible gambling tools and resources . Dr. Gainsbury has received grants from Gambling Research Australia; NSW Office of Liquor, Gaming and Racing; Echo Entertainment; Aristocrat Leisure Industries; Manitoba Gambling Research Program; and Sportsbet pertaining to research to understand and enhance the responsible provision of Internet gambling, research to understand optimal treatment approaches for gambling, research to enhance responsible gambling strategies and assessment of problem gambling among casino employees. Dr. Gainsbury has received honoraria from the Department of Broadband Communication and the Digital Economy, Department of Social Services, Gaming Technologies Association, British Columbia Lottery Corporation and Nova Scotia Provincial Lotteries and Casino Corporation for research and expertise to inform responsible gambling messages and responsible gambling strategies for Internet gambling. Dr. Gainsbury has received travel accommodations or expense reimbursement from the British Columbia Lottery Corporation, Clubs ACT, Leagues Clubs Australia, National RSL Clubs, Nova Scotia Gaming Corporation and Casinos Austria to attend and present at conferences on topic of responsible gambling. Dr. Gainsbury was a board member on Techlink Entertainment’s Responsible Gambling Advisor Board from January 2012 through May 2013. Wardle H, Sproston K, Orford J, Erens B, Griffiths M, Constantine R, Pigott S. British gambling prevalence survey 2007. Nat Cen; 2007 Available from: http://www.gamblingcommission.gov.uk/pdf/britsh%20gambling%20prevalence%20survey%202007%20-%20sept%202007.pdf. National Gambling Impact Study Commission. National Gambling Impact Study Commission-Final Report; 1999. Available from http://www.ncfpc.org/specialngisc.html. Gainsbury S, Russell A, Wood R, Hing N, Blaszczynski A. How risky is Internet gambling? A comparison of subgroups of Internet gamblers based on problem gambling status. New Media Soc. 2014. doi: 10.1177/1461444813518185. Based on an online survey, problem and non-problem Internet gamblers were compared. Problem gamblers were shown to represent a distinct cohort of gamblers, demonstrating the heterogeneity of Internet gamblers. Problem gambling respondents were younger, less educated, had higher household debt, lost more money and gambled on a greater number of activities, and were more likely to use drugs while gambling as compared to non-problem and at-risk gamblers. For problem gamblers, Internet gambling poses unique problems related to electronic payment and constant availability leading to disrupted sleeping and eating patterns.